May 22, 2017 /0 Comments/in Disability /by Reiter & Walsh, P.C. Children with neurological dysfunction due to brain injury at birth may have a range of health complications. In some cases, children with milder brain injuries may have less severe impairments, but in other cases, the extent of disability may be more severe. Health situations can change as children grow, as well. For example, the brain injury that causes cerebral palsy does not get worse, but symptoms can intensify, especially as children hit growth spurts during puberty. Parents may not always have the ability to care for their child around-the-clock, especially if both parents work during the day or if they can’t sync up their work schedules to take shifts. If parents have 9-to-5 jobs, they might not be able to watch their child at night when they need sleep. In these situations, a highly-trained and experienced caregiver may be a good way to ensure the child has their medical needs met as they go through daily life. Getting transport to get to and from appointments. Caregivers can help with this in many cases. The presence of a trusted and well-trained caregiver can help identify and address situations in which a person with cognitive disabilities may be taken advantage of or exploited, and help ensure the person with cognitive disabilities is not treated unfairly. Some children with, for example, spastic quadriplegia, may not necessarily use a wheelchair. They can still have some associated risks in terms of physical stability and strength, especially in terms of fall risk. Children with, for example, hemiplegia, may have single-side weakness that can make getting out of bed or getting into or out of the tub or shower potentially risky, and those with lower-limb spasticity may have limitations in ambulation. Physical safety can also be an issue if there is a fire, smoke, flooding, or another hazard in the house. A person with mobility limitations may need some assistance in navigating hazards quickly and safely. Some children with birth injuries use specialized feeding tubes or tracheostomy tubes (to bypass obstructed airways, clean or remove airway secretions, or more easily or safely provide oxygen to the lungs). This medical equipment requires specialized knowledge for operation and cleaning because these tools can pose a risk for infection or aspiration (which can lead to pneumonia or choking) if not properly handled. Families may not always have the ability to provide children with 24-hour care, and a trained and experienced caregiver can assist with feeding and making sure the child can properly breathe. Other children may have seizures or epilepsy as a result of birth injury. While in some children the seizures may be well-controlled, in other cases, health issues stemming from seizure disorders may necessitate 24-hour care. There are several situations in which parents might consider more intensive care for their child with disabilities or birth injuries. Seizures can happen at night while family members sleep; a caregiver may be helpful for monitoring the child at night. They may also be helpful during the school day or during times when parents are working or the child is in school. Some children may have their seizures well-controlled by medication, but there remains a risk for breakthrough seizures, which can occur seemingly at random. Even for children with normal cognition, seizures pose a major health risk, as ongoing and continued seizures can make neurological dysfunction worse. Individuals in the middle of a seizure can’t administer medication to themselves or get themselves medical care, so it may be worth thinking about having another person around to watch the child to ensure someone is there to administer medical care in the case of a breakthrough seizure. In many cases, parents and medical professionals are able to find the proper medications to help control their child’s seizures. In some children, however, seizures might be difficult to control, even after trying out multiple types of medications. In these situations, it is even more critical to have an experienced caregiver watching them. Seizures can come on fairly suddenly, which means caregivers should be on the alert. In some cases of seizure disorders, some children may have status epilepticus (SE), a disorder where they may have multiple seizures one after another without a return to baseline in between. This is a medical emergency, as this pattern of seizures can worsen existing brain damage and be life-threatening. Prolonged seizures are also associated with an increased risk of developing epilepsy and of unfavorable outcomes in cognition and behavior, and persistent seizures tend to become more self-sustaining over time and resistant to medication, which makes prompt intervention critical. Children at risk for SE may need a trained caregiver on hand in case they have SE, because the caregiver will need to provide emergency/rescue treatment to the child and take the child to a doctor for emergency care. Experienced and highly-trained caregivers are definitely an investment, but their assistance is critical for many families, especially for children who are medically fragile or have multiple complex disabilities. Especially in the case of birth injuries, hiring a trained caregiver may not be unattainable. If parents are able to find an attorney who is willing to take on their case, the funds from a birth injury settlement or verdict can go towards the cost of hiring a caregiver, helping families obtain peace of mind and ensuring the child has their medical needs met. 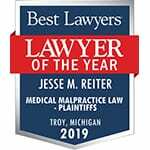 The birth injury attorneys at Reiter & Walsh have been helping children with cerebral palsy, HIE, and other birth injuries since 1997, helping families secure their children’s futures. Our attorneys solely focus on birth injury and nothing else, giving them the expertise, deep content knowledge and experience needed to successfully help children with birth injuries live their life to the fullest.